It seems November was the month for wargaming and military history journals, as in addition to Slingshot my copy of Arquebusier recently arrived. Arquebusier being the journal of the Pike & Shot Society. With a much smaller membership the Pike & Shot Society Journal is also more limited, comprising around 48 A5 pages per issue. This of course means there are fewer articles. However, as in previous editions it retains its academic flavour and as such it will find favour more with the student than the casual wargamer. The current edition comprised what looks to be the start of a series entitled “A Study of Orders of Battle from the Age of Louis XIV”, by Iain Stanford. The first article being a review of British Regiments at the Battle of the Dunes (1658). An interesting introduction soon develops allowing the author to review details on the various regiments, both from the New Model, but also those of the Royalists who fought in the campaign and battle. Comprising just over 20 pages it is clearly the centre piece of this issue. As well as placing the orders of battle in a campaign context there are some particularly interesting gems in this article for those interested in the British Civil Wars. A very interesting article. The second article is that by Stephen Ede-Borrett where he reviews the regiments of Turenne during the Thirty Years War and Franco-Spanis War. While the third main article is part two of a price on Muscovite Select Soldier Regiments, translated from Russian. Both interesting but heavy and outside my area. A short review of the rules Maurice is provided before the useful book reviews section that completes the edition. This time however these book reviews have more warnings to perspective purchases, than recommendations which is not a bad thing! 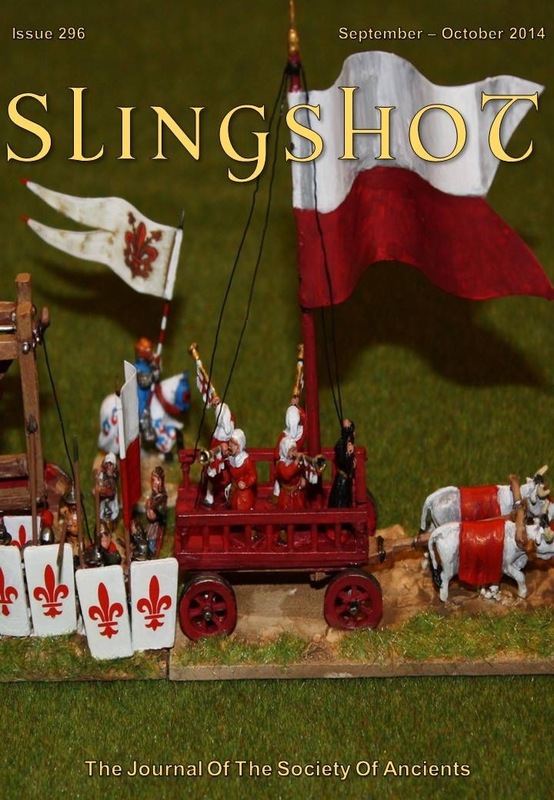 It has been two weeks since the latest copy of the Society of Ancients journal “Slingshot” arrived in my mailbox. After a series of editors, along with a series of publication delays, the current editor and his team seem to be getting the publication back on track with one journal being published every two months. I take my hat off to these stalwarts that pour so much time into the society. Battle day reports aside there were two other articles that caught my interest. First, was that by Justin Swanton and comprised eleven pages with illustrations and solid references. In his article Mr Swanton explored the Macedonian cavalry wedge using historical textural references across five battles. He then explored the dynamics through theory and scale diagrams. An interesting article especially as I’m catching up on painting some long overdue Greeks and Macedonians at the moment. The second was that by Richard Taylor who in this issue completed his four part series on wargaming. In this article he looked at troop classifications, units and victory in various wargames rules. We all have some views on rules, Mr Taylor provided some considered thoughts which I suspect would provide most wargamers with some points to ponder. All up, an interesting issue.